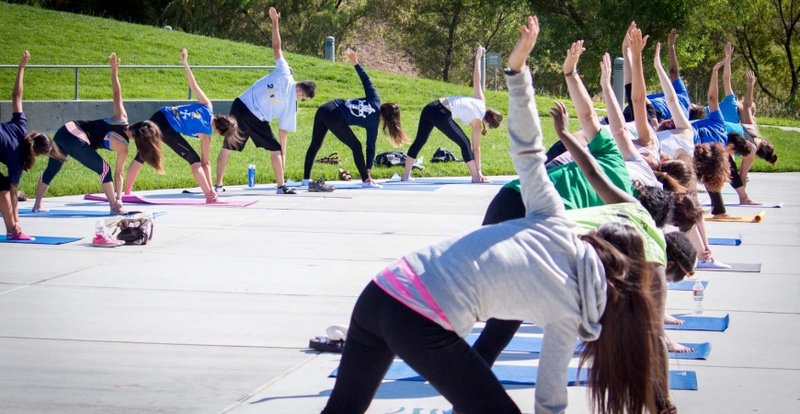 UC Merced will host a Healthy Campus Network Celebration Thursday, Oct. 11. Walking tours, a health resources fair, open house events, free food and sway giveaways are planned. UC Merced already strives to be the most sustainable and innovative research university. Now, a new initiative aspires to help the campus become one of healthiest — and students, staff and faculty members are invited to join the effort. On Thursday, Oct. 11, UC Merced and its nine sister campuses will participate in the inaugural Healthy Campus Network Celebration . The event will include several walking tours, a health resources fair, open house events at the on-campus food pantry and newly-relocated Health Promotions office. Free food and swag giveaways are part of the festivities. “UC Merced’s Healthy Campus Network will highlight the resources and programs available at our campus and bring people together to reach a goal of creating the healthiest campus for students, staff and faculty to work, live and learn,” Office of Campus Climate Director De Acker said. Departments, offices and programs from across campus – including the Blum Center for Alleviating Poverty and Social Disparities , Graduate Division,Health Promotion,Basic Needs Security,UC Merced Sustainability, Recreation and Athletics, the Office of Campus Climate, the Office of the Chancellor and others – are partnering to highlight and promote mind and body wellness activities, resources and programs offered at UC Merced. UC Merced’s Healthy Campus Network will highlight the resources and programs available at our campus and bring people together to reach a goal of creating the healthiest campus for students, staff and faculty to work, live and learn. The celebration offers something for everyone. Staff members are invited to take a moment to practice mindfulness during the launch of a mindfulness research project that will study meditation for stress-reduction. Anyone can tour UC Merced’s new food pantry, located in the residence halls, and the Health Promotions office in the new Granite Pass building. Also scheduled: Professor Anna Song, director of UC Merced’s Nicotine and Cannabis Policy Center , will give a keynote talk about the center and its research to enhance understanding of tobacco and cannabis use, prevention and cessation. Energizing Morning Lake Walk, 9 to 11 a.m. — Grab your walking shoes and fitness tracker and join the Graduate Division for an energy-boosting walk to Lake Yosemite. Walkers will meet at the welcome table outside the Joseph E. Gallo Wellness and Recreation Center on Scholars Lane. Refreshments will be provided. RSVP here . Healthy Campus Network Celebration Fair, 10 a.m. to 2 p.m. — Discover on- and off-campus resources promoting a healthy lifestyle during Celebration Fair. Organizations and departments will table outside in the south patio area of the Leo and Dottie Kolligian Library. Health Promotion Open House, 10 a.m. to 2 p.m. – Health Promotion invites students to check out its new location in Room 159 of the Granite Pass building. Find out how the office promotes student well-being and learn about available resources during an open house. Prize giveaways are part of the festivities. Food Pantry Open House, 10 to 11 a.m . – Visit UC Merced’s newest resource for food security during a one-hour open house. Come enjoy free coffee and snacks at the UC Merced Food Pantry, Room 131 of the Terrace Center in the residence halls. Campus Community Garden Tour, 11 a.m. and 1 p.m. – See how UC Merced’s community garden grows during a tour of the campus’s community garden, off Ranchers Road near the Half Dome residence hall. Tour times are 11 a.m. and 1 p.m. This event is open to the public. RSVP to reserve a spot . Public Health Student Walk, 11 a.m. – Learn about the innovative discoveries and research public health graduate students are working on during this walk. Participants will meet on the north side of the Social Sciences and Management building. Keynote Talk: Professor Anna Song, 2:30 to 3:30 p.m. – Song will present an overview of UC Merced’s new Nicotine and Cannabis Policy Center in Room 390 of Classroom and Office Building 2. The policy center is the first one funded by the Tobacco Related Disease Research Program. Refreshments provided.